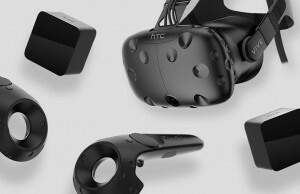 Valve’s monthly Steam Survey has long offered some useful insight into which headsets are actively connected to users computers and the share of the Steam population that’s using each, but the figures provided are relative to the non-static Steam population, which obfuscates the actual adoption trend of VR headsets on the platform. To demystify the data, Road to VR has created a model which derives actual headset counts by correcting for Steam’s changing population. The result reveals a trend of headset adoption that’s a near perfect exponential growth curve. 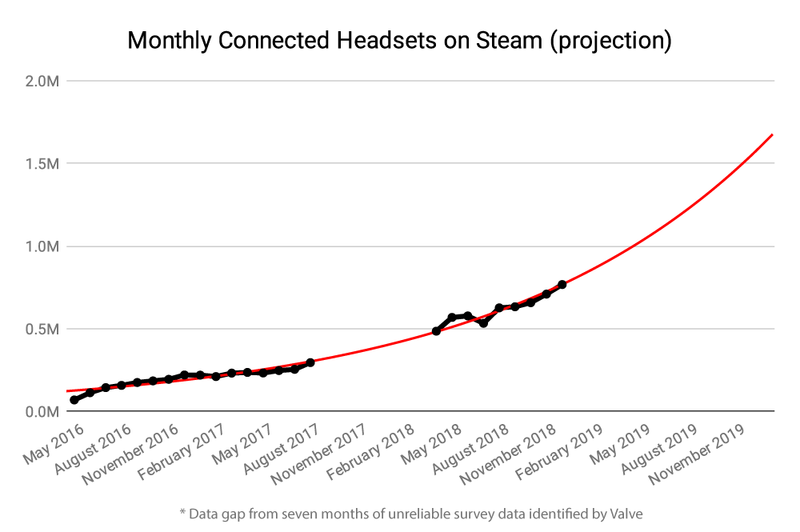 Each month, Valve runs a survey among Steam users to determine some baseline statistics about what kind of hardware and software is used by the platform’s population, and to see how things are changing over time; that includes which VR headsets are connected to users’ computers. 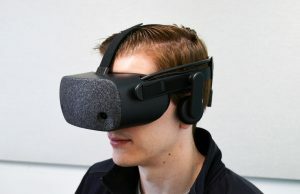 Participation in the survey is optional, and headsets aren’t counted if they aren’t connected and powered on at the moment that the data is collected. 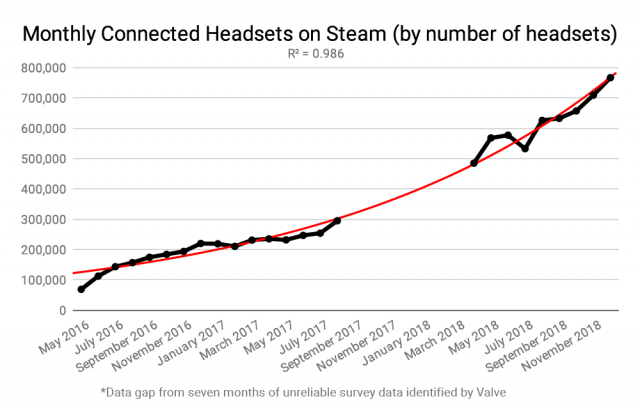 While the survey has been a useful way see which headsets are most popular among those using them on Steam, the trend of all headsets on Steam has always been obfuscated because the data points given are exclusively percentages relative to Steam’s population, which itself is an unstated and constantly fluctuating figure. That is to say, even if the percent of headsets in use on Steam as given by the survey was static month after month, the actual number of headsets in use on Steam would still be changing in proportion to Steam’s changing user population. 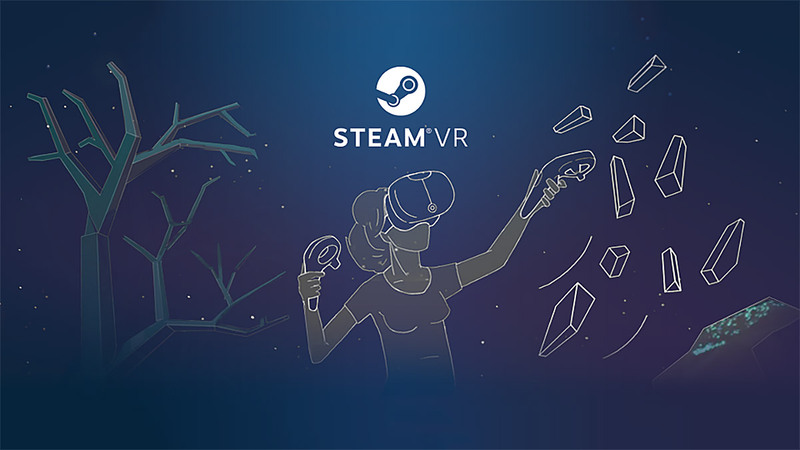 Road to VR maintains a detailed log of VR data from the Steam Survey dating back to April 2016, the month that the first consumer VR headsets launched. 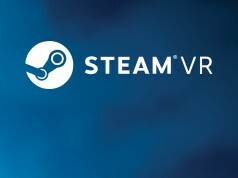 With help from our friends at VR/AR intelligence firm Greenlight Insights, we’ve created a model based on the historical data, along with official data points directly from Valve and Steam, which corrects for Steam’s changing population by estimating the actual count—not the percent—of users on Steam with connected VR headsets. 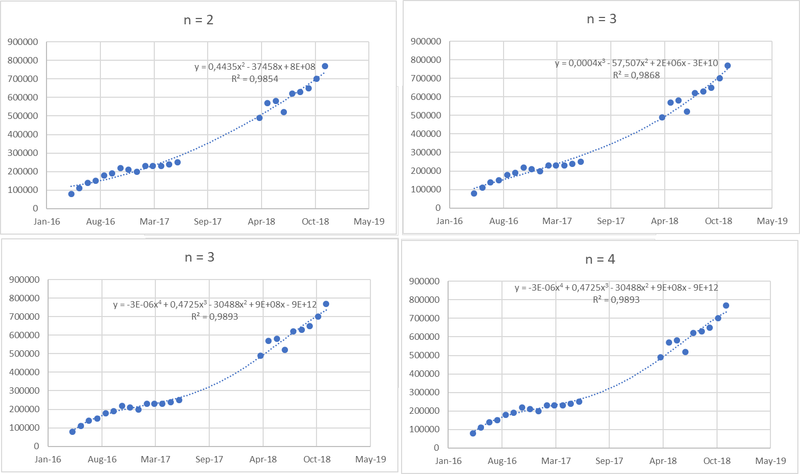 After correcting for Steam’s changing population, the result shows an adoption trend which closely fits mathematically exponential growth, with an R² value of 0.986, starting from the month that the first consumer headsets hit the market. 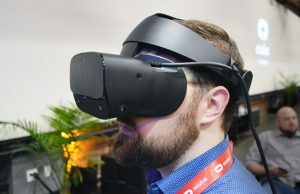 The result also shows that growth in the actual number of VR headsets is greater than has been recently reported; having grown by 160% from April 2017 (294,800 headsets) to December 2018 (766,862 headsets). Worth noting about the results: we’re talking about monthly connected headsets here, as the underlying Steam Survey data is a snapshot of activity for each month. 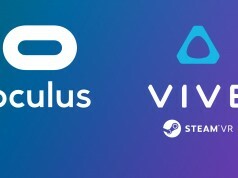 In the case of VR headsets, that means that the figure we’re estimating is how many unique headsets are connected to Steam users’ PCs over the course of a given month; it’s the closest official data point we have to active headsets, but doesn’t tell us the extent to which those headsets are actually being used. Furthermore, the Steam Survey comes from a sample of the user population, not a comprehensive count, though Valve maintains the data offers an accurate snapshot. And of course, these figures are only inclusive of Steam, and don’t offer a complete picture of activity on Oculus’ platform (as some or any picture at all of Sony’s PlayStation VR. It’s not clear how long this trend will continue, but we can make a (naive) projection based on what we’re seeing today, which suggests some 1.5 million monthly active headsets by the end of 2019. Of course this projection is purely drawing out the exponential line, and doesn’t attempt to account for an array of other factors: crucially, in a young market like VR, things like cost, new features, and innovative content (or lack thereof) stand to influence the trend in significant ways. Update (January 30th, 2019): Further clarified that the projection chart is just to see where the curve is heading when you draw out the exponential line; it should not be taken as a forecast. To prevent people from referencing the chart alone with none of the stated assumptions, we’ve also reduced the projection timeline from three years into the future to just one. Content wise kind of, the devs are not convinced yet. Haven’t heard anything too exciting for the 1st quarter. Nah, I’m never buying VR for console. By the time more powerful console come out, the PC will be even more powerful and the story continues forever and ever and ever. I don’t think they care about VR in general. To be honest, they want to sit sinking into a coach and push buttons. I will not be a slave to what Joe at walmart wants and don’t care if my hobbies are niche. Is this a joke? Do you know how analytics firms have lost their client because of their tendencies to confused PR/Marketing spins with the actual datas or projections that are asked. This is based on real data and the methodology is clearly stated, including how the naive projection is drawn. You’re assuming that the market has already taken-off to follow a steady exponential growth. But then looking back again at your projections for 2019 it’s probably more on point, sorry. 7 million connected headsets in 3 years seems like a bit of a stretch. I don’t think there are 7 million google cardboards in existence, and they cost like a dollar. You don’t have enough data points to prove it is exponential and not linear. It’s possible, if the requirements to run VR on a PC drops waaaaaaaay down. Or they create a stand alone that is powerful enough to at least match a PSVR. But, I highly doubt it. it already has. You can run 90% of the most popular vr games with a 4yo processor and a GTX 970 or better. Indeed with Windows MR headsets offering low spec entry point & htc testing settop box version of their OG Vive. 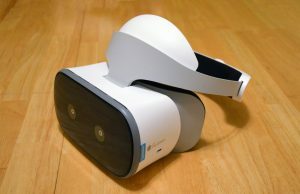 There is more VR headsets out there. Cardboard/Daydream, psvr, Wmr standalone. 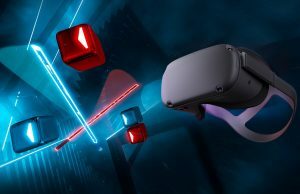 Even the high end has pimax for ultra wide FoV on the rise; sure it’s too bad StarVR seems to be collapsing but in truth it’s pricepoint is too high. We tend to buy 2 years back from the bleeding edge and our new computer’s quick start guide had instructions for attaching a VR head set. In 2-3 years entry level machines will be VR capable. According to Nvidia, there are over 4 million PC VR headsets. The Steam Survey data has long been used in this way to estimate monthly active users and doesn’t include users who use Oculus Home primarily (a good chunk of which rarely touch Steam for VR). The survey is also opt in, which means that a number of users will choose not to participate. Headsets have to be plugged in and powered on, which again is likely to affect the actual numbers. So, 800k monthly active users is only part of the equation and it’ likely closer to 1.5 million+ monthly active users for PC VR. I wouldn’t doubt hitting the likelihood of hitting 3 million monthly active PC VR users by the end of 2019, but beyond that is difficult to predict. This would mean that we already hit a “3 million in 3 years” mark and it’s whether or not momentum continues in the future. PSVR also isn’t included in these numbers, but play many of the same games (there are a number that are cross network too). At about 4-5 millions users at this point, which we now know is roughly the same as PC (previously, PC was thought to be about half that, even by optimistic estimates), so it’s likely that there are at least another 1.5 million monthly users playing the same or similar games on PSVR. Other factors, such as all in one headsets, may change the dynamics long term too. 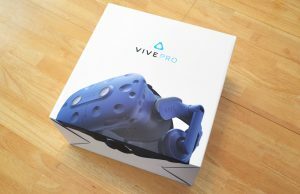 While woefully underpowered compared to PC, these devices are a lot more convenient, which may take some of the steam away from Steam VR and other PC platforms. 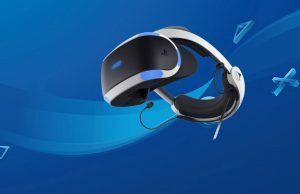 PS5 is going to be released likely within about 3 years, so a PSVR2 could also affect things long term. Long term really just depends on these types of unknown factors. Mobile didn’t kill PC or console; far from it. 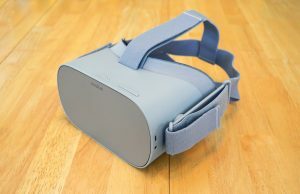 So, standalone “mobile” VR may not affect high end PC VR at all. 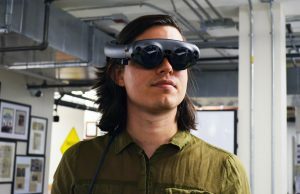 Then there is also the confusion with AR and the average consumer not really understanding the various use cases of AR versus VR yet, which will eventually get sorted out, but may cause some wacky adoption trends for a while once a halfway decent AR device is available. If they can solve a few problems, I bet that adoption will be much greater than the Road to VR curve. If progress stagnated and we stay similar to what we have right now with only slight resolution increases, then it may be lower. 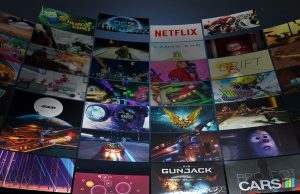 The Oculus aspect is interesting, there are posts on the Reddit from users complaining about Steam performance with Oculus, some avoid purchasing games on Steam /using Steam or use OpenComposite. This must skew results and could cause large under reporting of total PC VR headset? 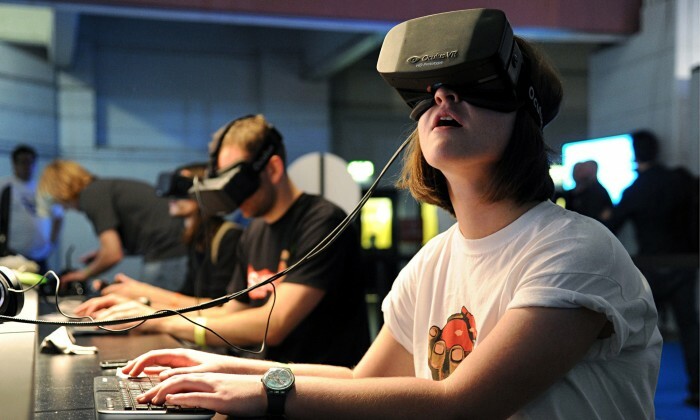 With Oculus you are running Oculus>Steam>Application so perhaps for users with less powerful PC its valid concern. I never left my Rift, Vive or WMR plugged in (never trusts cats and cables) so unsure if I ever counted in surveys going back to 2016. Why would adoption of VR be linear when tech adoption usually fits the Rodgers curve? Exponential is the right fit to make. 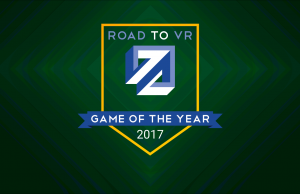 Great news for fans of games like Pavlov, VR Chat and Contractors. R square of 0.989! Even better! But a polynomial function doesn’t consider the reality of the situation: people connecting VR headsets to Steam are growing, and the number of people using Steam in general (Steam’s population) is also growing. Well, you could have an exact fit if you increased the polynomial order up to the number of data points. You can see why that isn’t done when you look at the extrapolation beyond the data range, or try to fit a single new measurement and the whole fit changes. 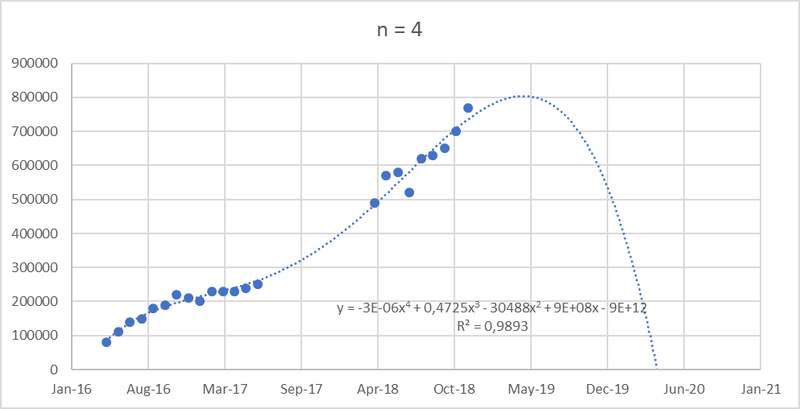 That’s why polynomial works better if you’re going to assume the market has already taken-off to follow one of the adoption curves: polynomial curve is a way to make-up for both positive and negative signals of which all the causes or emergences cannot be accounted for. But VR is a gimmick and a fad and it’s failing and dying–RIGHT? Yes, yes! The Luddites very much want you to agree that VR is indeed on its last legs and you should go back to flat gaming immediately. After all, it’s only a fad – just like 3D home theater (which they did successfully kill off). I actually think 3D movies will survive too, and ironically it will probably be VR that gives them they’re breakthrough moment. Once VR hits its stride and people start watching more 3D movies in VR, I think it’s going to finally stick. 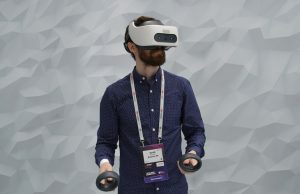 The inability to see why 3D home theater failed but VR won’t is because they can’t tell the difference between a passive fixed-view experience and an active interaction with hand controllers and head in the 3D space. It’s true VR is a revival of 3D video content like @impurekind:disqus said, but once you get past standard “Google Cardboard” with even a 3DOF controller the Daydream and GearVR/Oculus GO use, you’re starting to touch on immersion opportunities that 3D TV simply can’t provide. What’s the r^2 on linear growth? Good question, linear line R^2 is 0.958. Amazed by all the excuses and reasons people make for VR instead of just tackling what they’re supposed to developer side. People claim low numbers, not enough support, and such when it would just be easier to just support the “low numbers” to make it grow. I mean, look at Sony who had to shoulder the costs of PSVR to help PSVR developers shine on it to then reap in the rewards because they allowed a VR community to grow. Same with Scanner Sombre, Asseto Corsa, and whoever added VR support. Numbers is one thing, but if you alienate the player base over numbers then they’ll remember it. They’ll keep making one VR request thread after another until you have VR support. Now, if you add in VR support they’ll let the past be and just play VR. But this is nice to see. Wish we had Oculus side of things, and Vive home (if it has one) to see a larger picture. I kniw its anecdotal and all, but Im on the elite dangerous facebook community threads and everyday you would invariably see at least one “I got a VR headset…WOW! Best thing EVER!! Now THIS is how you should experience Elite” post on there which is always great to see. Gave me an impression of a slow but steady uptake anyway. That game has been great for vr hats off to Frontier Developments. I never understood, what you are supposed to do in VRchat? Chat with people, explore, have fun, listen to mix. It’s more than chatting, People Roleplay, people build worlds, watch youtube/Twitch stream, and just unwind. 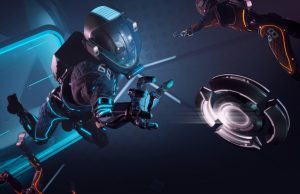 There are worlds themed to different games that it’s like a hub for VR prototype games so you can shoot things, play horror games, fly around in planes, among other things. There’s so many fun worlds. People also use VRchat to dance because no other VR game allows you to dance. There’s just so much you can do. 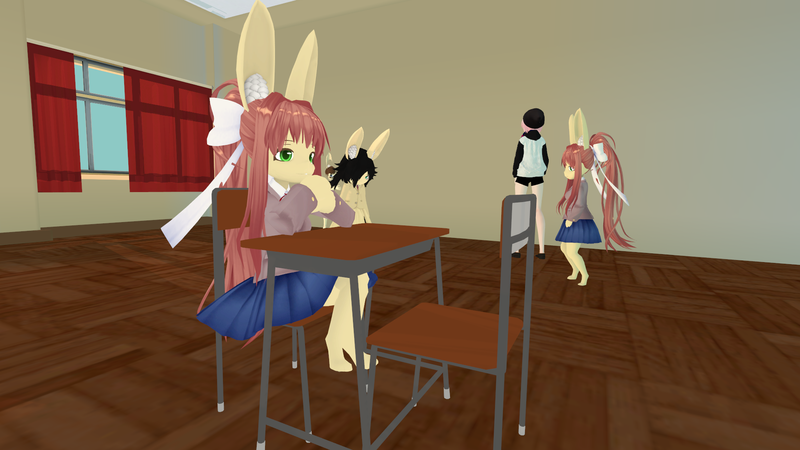 When you have VR you can also use VRchat’s VR camera feature to take pictures. I love using that the most. Ok cheers. I will give it another go. Good luck. If you’re worried about toxicity then join the second most populated worlds. Never the main ones. To enjoy VRchat you have to explore the second most populated worlds onward. Just take your time, have fun, and it’ll eventually reward you for your time. If you have any doubts about VRchat then find a peaceful world to chill in while taking your time exploring the worlds menu. Wish you the best, and good luck. Yeah, I wasn’t sure if you’d accept what I would say or not, thus wording issues. Especially VRchat. Haha! Yeah, both VRchat & Beat Saber shifted tons of headsets yet people keep mocking both those games. But yeah, VRchat changed everything for me. People will always focus on the negativity while I’ll always love the positivity in the game. No other game allows you to do full body tracking, something my friends enjoy doing when able. I love chillin, I love hanging out with people, or even chill-exploring worlds seeing how creative people are in there. VRChat is beginning of metaverse, also a social improvement experiment. Never heard of scanner sombre. I guess I’m in my own little be bubble with flight and driving Sims both with strong VR communities. Now who wants so many headsets Oculus (& variants), Vive(& variants) , Sony PSVR & its console, MS AR/VR headsets(Acer,Lenovo,HP) & so on. Mabbe u need a cupboard to keep the VR harware. But MS is appreciated becuz at least their headsets have common ground. For this thing to take off, they need something like a Steam machine I dont know… Nice looking (console style) PC boxes for living rooms, all VR ready, plug and go. Price tag USD400-600. Most of people who play PSVR they have no clue about the PCs and feel on a thin ice when PC is considered. 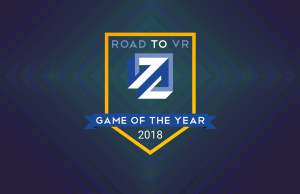 It’s nice to see the platform’s growing and adoption proceeding nicely, but I’d feel a lot more confident in the growth of VR if I saw more AAA titles for it being announced. When you look at how big the pc and console market is in comparison I think it will be a long time. Best hope is if they adapt some old games to vr, even then we need a few more million for it to be more common. Or maybe valve release their headset and games. Although valve is not the same valve that put out games. Maybe second gen headsets 2020 will be big boost of enthusiasm for devs. 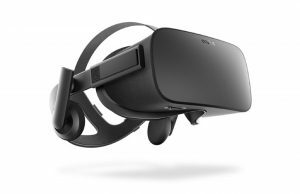 is this VR headsets are compatible with Omnidirectional treadmills?